Other issues involving photojournalism include the right to privacy, negotiating how the subject desires to be depicted, and questions of whether compensation is warranted. Especially regarding pictures of violence, photojournalists face the ethical dilemma of whether or not to publish images of the victims. The victim's right to privacy is sometimes not addressed or the picture is printed without their knowledge or consent. The compensation of the subject is another issue. Subjects often want to be paid in order for the picture to be published, especially if the picture is of a controversial subject. Another major issue of photojournalism is photo manipulation – what degree is acceptable? Some pictures are simply manipulated for color enhancement, whereas others are manipulated to the extent where people are edited in or out of the picture. War photography has always been a genre of photojournalism that is frequently staged. Due to the bulkiness and types of cameras present during past wars in history, it was rare when a photograph could capture a spontaneous news event. Subjects were carefully composed and staged in order to capture better images. Another ethical issue is false or misleading captioning. The 2006 Lebanon War photographs controversies is a notable example of some of these issue, and see photo manipulation: use in journalism for other examples. ^ Laurel Brake; Marysa Demoor; Margaret Beetham (2009). Dictionary of Nineteenth-century Journalism in Great Britain and Ireland. Academia Press. p. 495. ISBN 9789038213408. ^ "Barricades in Rue Saint-Maur-Popincourt, 25th June 1848". PBS LearningMedia. Retrieved 9 December 2017. ^ Keith Hayward; Mike Presdee (2010). Framing Crime: Cultural Criminology and the Image. Routledge. p. 38. ISBN 9780203880753. ^ a b Harding, Colin (2012). 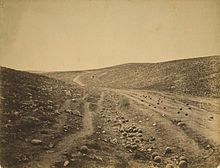 "Photographing Conflict: Roger Fenton And The Crimean War". National Media Museum. ^ Elliott S. Parker (1977). John Thomson, Photojournalist in Asia, 1862-1872. 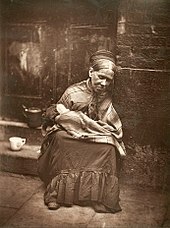 ^ "The photographs of John Thomson". National Library of Scotland. ^ "Welcome to... / Bienvenue r". Collections.ic.gc.ca. 2001-05-01. Archived from the original on 2011-11-03. Retrieved 2011-12-10. ^ Campbell, W. Joseph (2004). "1897 American journalism's exceptional year". Journalism History. Winter. ISSN 0094-7679. Retrieved 17 April 2013. ^ Gervais, Thierry (May 2005). 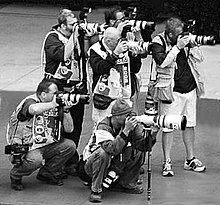 "Photographies de presse". 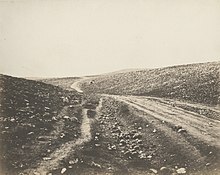 Études Photographiques (in French) (16): 166–181. Retrieved 13 June 2012. ^ a b Mila Ganeva, Women in Weimar Fashion: Discourses and Displays in German Culture, 1918–1933, Screen cultures, Rochester, New York: Camden House, 2008, ISBN 9781571132055, p. 53. ^ Mary Warner Marien, Photography: A Cultural History, Upper Saddle River, New Jersey: Prentice Hall, 2002, ISBN 9780810905597, p. 235. ^ Corey Ross (2008). 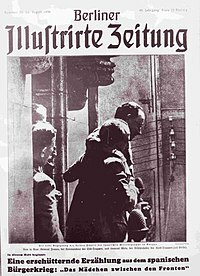 Media and the Making of Modern Germany: Mass Communications, Society, and Politics from the Empire to the Third Reich. Oxford/New York: Oxford University. p. 30. ISBN 9780191557293. ^ Tim Gidal, "Modern Photojournalism: The First Years", Creative Camera, July/August 1982, repr. in: David Brittain, ed., Creative Camera: 30 Years of Writing, Critical Image, Manchester: Manchester University, 1999, ISBN 9780719058042, pp. 73–80, p. 75. 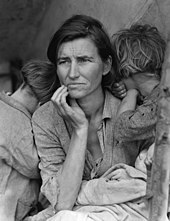 ^ Maria Morris Hambourg, "Photography between the Wars: Selections from the Ford Motor Company Collection", The Metropolitan Museum of Art Bulletin N.S. 45.4, Spring 1988, pp. 5–56, p. 17. ^ Sherre Lynn Paris, "Raising Press Photography to Visual Communication in American Schools of Journalism, with Attention to the Universities of Missouri and Texas, 1880's–1990's", Dissertation, University of Texas, 2007, OCLC 311853822, p. 116. 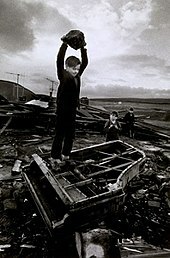 ^ "Father of photo-journalism, Cartier-Bresson, dies at 96". The Guardian. ^ "Erich Salomon, photographer". Eduardo Comesaña. ^ "Photography exhibit sparks symposium". Abraham Lincoln Brigade Archives (ALBA). ^ "Underfire: The Untold Story of Pfc. Tony Vaccaro' reveals the intimate relationship between a war photographer and war itself". LA Times. ^ Stovall, Jim (2005). "Magazines and Photojournalism's Golden Age". Jprof.com. Archived from the original on 2013-03-09. Retrieved 2012-09-16. ^ Malo, Alejandro. "Documentary Art". ZoneZero. Retrieved 2010-12-05. ^ "Historie" (in Danish). pressefotografforbundet.dk. Archived from the original on 2002-06-09. ^ British Press Photographers Association; Hong Kong Press Photographers Association; Northern Ireland Press Photographers Association; (in Swedish) Pressfotografernas Klubb; (in Norwegian) Fotojournalisten. ^ Kurtz, Howard (2 February 1994). "L.A. TIMES GETS BURNED BY DISASTER PHOTOGRAPH". Washington Post. Retrieved 11 March 2017. ^ Keller, Jared. "Photojournalism in the Age of New Media". theatlantic.com. theatlantic.com. ^ Kovach, B.; Rosenstiel, T. (2006). "The Elements of Journalism; What Newspeople Should Know and the Public Should Expect". journalism.org. Archived from the original on 2013-10-02. ^ "Gamma's Bankruptcy Shows Shift in Photojournalism". New York Times. August 10, 2009. ^ dpreview.com 'No Future in Photojournalism' Interview: Dan Chung Barney Britton Feb 10, 2012. ^ a b c Lavoie, Vincent (2012-05-24). "War and the iPhone". Études Photographiques (29). ISSN 1270-9050. ^ Channick, Robert (May 30, 2013). "Chicago Tribune".